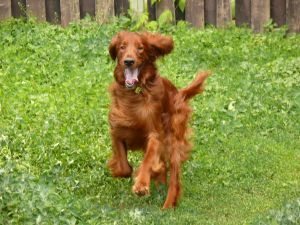 Should You Adopt The Irish Setter Dog Breed? Irish Setters are a great family pet and companion for any active people. This breed is known for its affectionate and playful personality. They get along well with children and other pets in the house. Like any breed of dog they need to be supervised around younger children and children need to be taught how to behave around dogs. This will ensure safety for both the pet and the child. Like many other hunting dogs they need a lot of activity and human companionship or else they will be hyperactive and probably destructive as well. They are very intelligent and fairly easily trained. The key is starting early and being consistent. They are also known as the red setter due to their deep red coat. Their coat is silky smooth and longer. They require frequent brushing to avoid matting. Daily brushing is ideal so keep that in mind when considering this breed.